Shipping & Availability FREE shipping on your 2nd row or 2nd and 3rd row FloorMat's when you purchase front FloorMats at the same time. FREE shipping on all additional sets of FloorMats (for a 2nd, 3rd, etc vehicle) when purchased at the same time. Bonus: FREE shipping on a CargoLiner if purchased with any FloorMat purchase. The WeatherTech All-Weather Floor Mats have deeply sculpted channels designed to trap water, road salt, mud and sand. Our All-Weather Floor Mats are made from an advanced rubber-like Thermoplastic Elastomer (TPE) compound that is an OEM approved, virtually odorless latex-free material, that contains no harmful PVCs, cadmium, or lead and is 100% recyclable! All-Weather Floor Mats are engineered to stay flexible in even the coldest of temperatures and feature a protective, non-stick finish to make cleanup quick and easy. To prevent shifting, the All-Weather Floor Mats include anti-skid ridges on the underside of the mat. WeatherTech All-Weather Floor Mats are manufactured in America to ISO 9001 standards, and also meet FMVSS302 standards – your assurance of quality. Available for cars, trucks, minivans and SUVs. 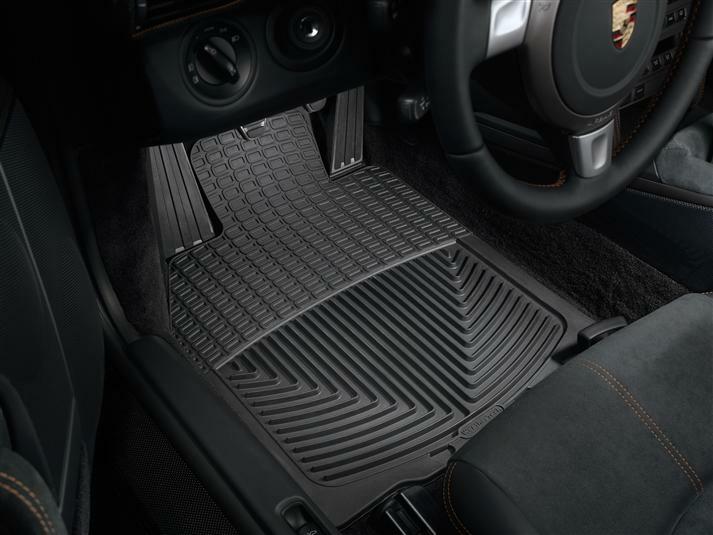 All-Weather Floor Mats were intended to give the best possible protection for your 2008 Porsche® 911 GT3 RS's floor. Many of our front and rear mat applications are model specific, while others are assigned as the best possible fit for your 2008 Porsche® 911 GT3 RS from our many shapes and sizes. Some rear mat sizes are designed to be trimmed so that they may be customized to fit almost any vehicle. Great gift for my Nissan Altima. My husband got the cargo liner and all 4 floor mats. The cargo liner fits like a glove and has a tall lip/is very durable. The floor liners fit perfect to and grip really well to the floor. I love them! Originally from Alaska, and temporarily displaced in Florida, I've used WeatherTechs in all of my vehicles across the US. In AK they catch every bit of the ice, snow, and mud that come off the bottom of your shoes and keep all the road salt off your carpets. In FL, worrying about all that beach sand is a thing of the past as well. When you get home just take them out and dump the sand on the ground. Kudos WeatherTech !!! Our trip to the beach with six dogs would have ruined the new carpeting. Thanks to a previous positive experience with WeatherTech, we ordered a complete set for our new Suburban - floor mats and cargo mat. The color matches the interior perfectly. We expect many good years out of this set. Orginal set in our 1999 Trooper is still going strong. Our family loves to take the Yellow Lab, Cary, to the drive in restaurant when can. Like all dogs she has a tendency to shed hair and does have muddy feet some of the time. So we added the floor mats and all is well. Look for Cary at the neighborhood drive in!!!! Recently I just purchased a 2009 Cadillac CTS-V; which is my 556 horsepower luxury dream car. In this day and age to be able to own such a car is a blessing and I wanted nothing but the best for it; including Weathertech products. To protect and complement my CTS-V, I purchased one of your cargo liners and All-Weather floor mats. I owned some of your products which were in my 2007 Escalade and when considering mats/liners for my new car, I knew were to look……..Weathertech.com! I was looking for a heavy duty replacement for the original rubber floor mats for my 70 Firebird. The carpeted mats always seem to fray, and don't look good after a few seasons. As I had previously used your products in my daily driver Grand Prix, I knew they would hold up and keep looking good. I thnk the pictures speak for themselves, the reproduction rubber mats I had look sad compared to the Weathertech pieces. Thanks for a great product. The WeatherTech Floor Mats cannot be beat! Beach sand to snow, it's contained on the mats and saves the carpet. Everyone is impressed with the fit and color match. I will definately buy them for any other new vehicle I get. I am a salesman who works in the newspaper ink industry, and travel a large territory visiting & entertaining various accounts. Needless to say, the car flooring gets a lot of wear and ink deposits on the mats. The standard mats which come with my company cars never seem to hold up, and are usually destroyed from ink or extreme ware before the car is ready to be traded. When I got my current car I wanted some mats that would hold up and not get destroyed so soon; plus I wanted something that looked good & could be easily cleaned. I found that in my WeatherTech mats. I was so impressed shortly after they were installed, I ordered a set for my cherished 20 year old, and I still call her my baby, 1989 Suburban. I would highly recommend this product, and plan to make future purchases on my next company car. My son was trashing the carpeted floor mats in my baby with his various (muddy) sports activities so I ordered a set of WT mats and was impressed by their quality and fit. Recently, I decided to trade it in for a newer car. You won't believe this, but I actually got additional value for my trade in for 2 things; a new set of tires and the WT mats. I was pleasantly surprised by that. Even the sales manager recognized the quality of your mats! What does “3rd Row” mean? "3rd Row" refers to the row of seats immediately behind the second row of seating. Your set will include pieces for both driver’s side and passenger side 3rd row seating, unless it is a single piece design. Does the All-Weather Floor Mats have a raised lip around the edge? Yes, the perimeter lip of the mat is ½" tall. How thick are the All-Weather Floor Mats? The thickness of the material is 3mm, but the mat is ½" in overall height. How deep are the grooves? The grooves in the All-Weather Floor Mats are 3/8" inches deep. Can I use the All-Weather Floor Mats in conjunction with FloorLiners? What does the quantity (QTY) selector change? The Quantity selector on the website does not determine the number of individual products to purchase, but rather the number of total product sets you will receive upon purchase. To change your selected product set, simply select one of the images under the "Select Your Set" heading in Step 1. This will allow you to purchase a full or partial set depending on your selection.